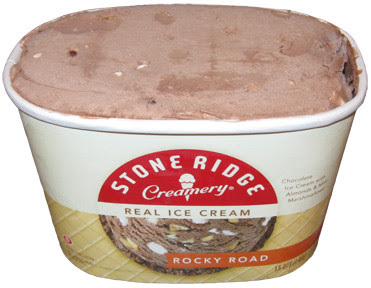 It's been too long since there's been some economical yet tasty stone ridge ice cream in the fridge. After my recent disappoint with Breyers "new & improved" Rocky Road (i.e. why did they mess with an old favorite? ), I decided my next Stone Ridge treat needed to be their take on Rocky Road. The first sampling we did was in Waffle Cones. The ice cream scooped well enough, and there appear to be a decent scattering of mixins, not a ton, but enough (which seems typical of Stone Ridge). Technically I had a few bites off the scoop first, then I had some in the cone. Stone Ridge has produced some decent products ...and this is no exception, even with the mini marshmallows! The base is a respectable milk chocolate flavor. The almonds are fine and the mini marshmallows ain't bad actually. They are soft enough and don't taste like the bargain bin variety, we'll call them middle of the road minis. I had another sample a few nights later and I still like it. I was going to make a milkshake but after dumping the first few scoops in my mouth instead of the blender, I decided to give in and just eat it the old fashion way. It's got a nice "real ice cream" texture, so I definitely put this above Edy's chewy slow churned Rocky Road. And there aren't any funny artificial tastes, so it goes above Walgreens as well. This is a respectable Rocky Road, especially considering it's an entry level store brand at just $2.79 a container. I wonder if we could convince them to make a Heavenly Hash with a marshmallow swirl? They could use it as an excuse to get away from the mini marshmallows.